Several of my favorite past NaNoGenMo entries are by a single creator: the multi-talented Liza Daly, the Boston-based software engineer behind World Writable and former CTO of Safari. 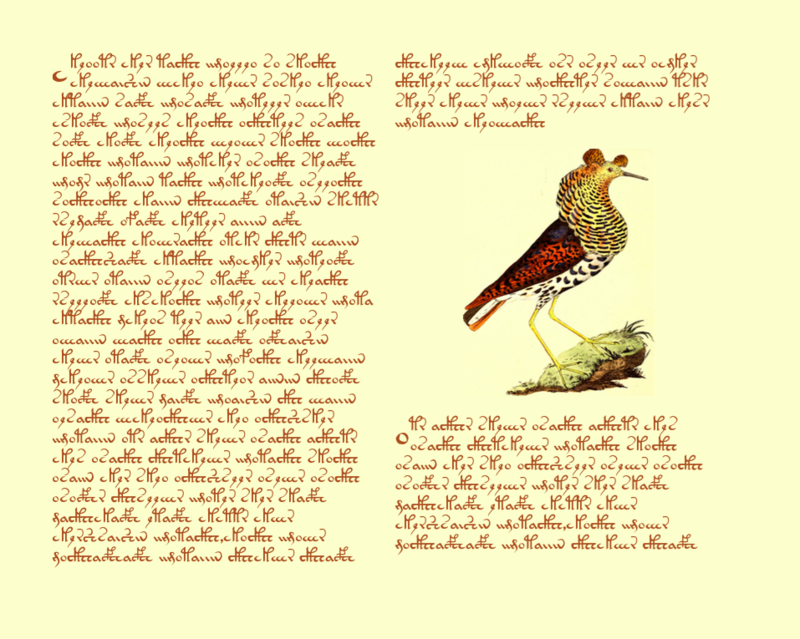 In 2014, Liza’s entry was Seraphs, a procedurally-generated codex inspired by the Voynich Manuscript, using a randomized corpus from Voynich, a Voynich-like typeface, the Flickr API, and the Internet Archive’s collection of 18th century illustrations. Last year, she created SAGA III, a reimagining of a 1961 MIT computer program that generated scripts for TV westerns, which were then filmed by CBS. This year, she’s submitted two entries so far. Very clever, but Liza’s second entry absolutely blew me away. 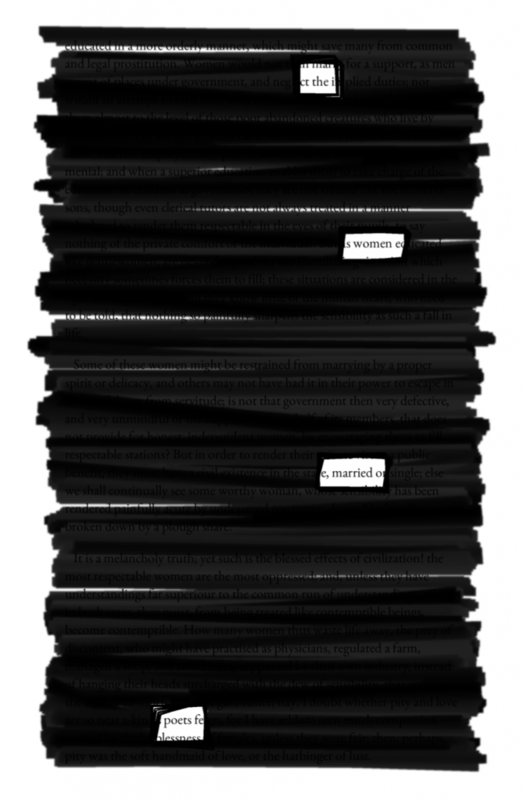 Blackout generates pages of text from a book or newspaper in the style of Austin Kleon’s Newspaper Blackout Poems. 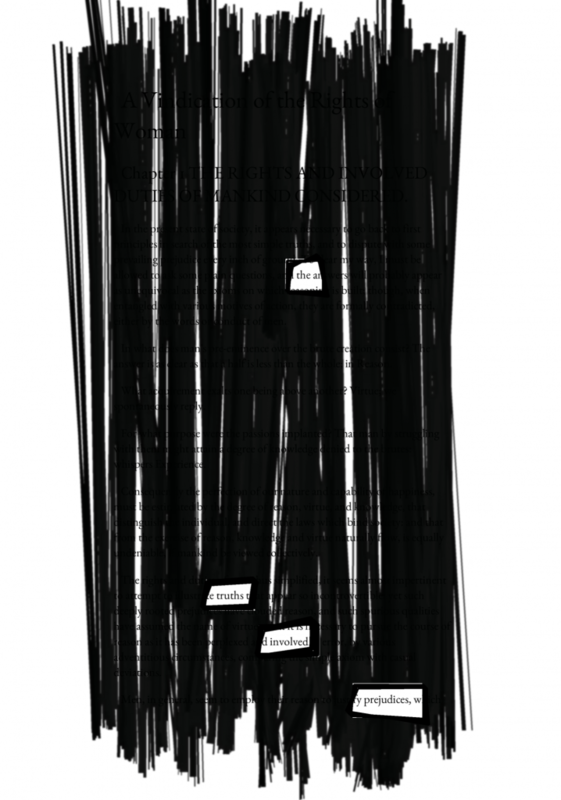 Using Mary Wollstonecraft’s A Vindication of the Rights of Woman as its source, the Blackout code generated The Days Left Foreboding and Water, a 45 page book of blackout poetry. The results are pretty amazing. 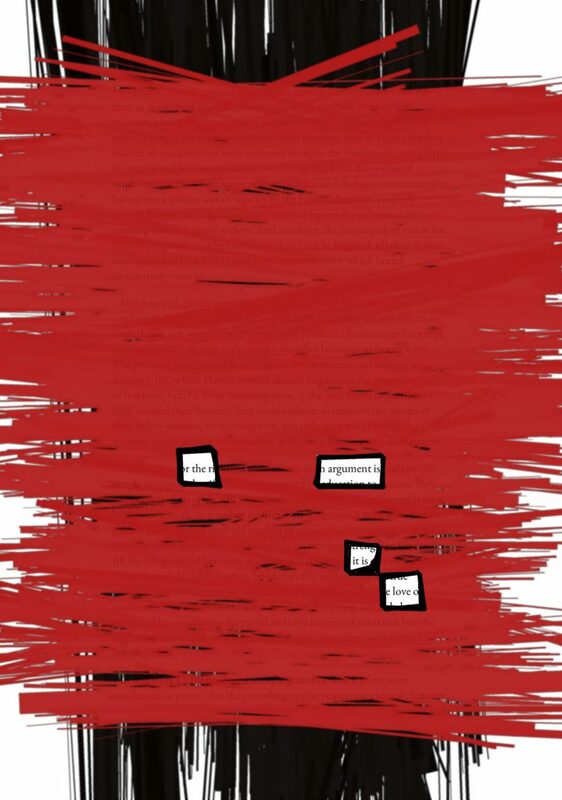 One side note: Austin Kleon first started making newspaper blackout poems in 2005, originally inspired by redacted FBI files, but once he started putting them online, he started getting emails and comments arguing that his work was completely unoriginal. The comet is now on it’s return to the sun—pursuant to a decree of the high court of chancery. At the meeting at Newcastle, Sir B. F. D. was in the chair—and appeared like a dull, faint nebulous star. Yesterday there were violent disputes in the common-council—For some time past the volcano has been extremely turbulent. Which, bringing it full circle, reminds me of Darius Kazemi’s @TwoHeadlines Twitter bot, but made with 1760s newspapers instead of Google News. There’s still a week left in November. It may not be enough time to write a novel, but plenty of time to generate one. Good luck!